Bookmarked to check on Monday morning and see what the bidding is at. I know, it’s a bit silly, but I’ve always sort of liked the Bricklin SV1. If the price doesn’t climb much, maybe I’ll try to win it, then fly down and drive it back up north. Being a 1975, it would be smog exempt, and thus ripe for a powerplant with far more to offer than the 351 Windsor’s paltry 175hp. 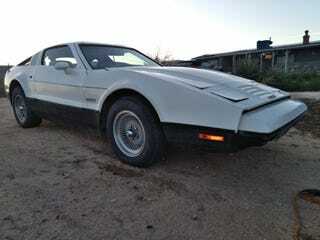 1975 Bricklin SV-1 on BaT. Alternatively, convince me that I’m a big dumb-dumb for even considering this as a proper waste of time and money. Of course, without knowing the reserve price, it could all be moot. And sure sure, my girl will probably kick me out if I buy it. But I could probably hack up a couple of my tents and build a sweet living space between this, the C5, and the Cube. The IKA-Renault Torino, A Conspiracy Theorist&apos;s Perceived Observation of Evil.